The following Lists of Palestinians are lists of notable people with either a self-designation (endonym) or a foreign appellation (exonym) as "Palestinian", or who were born in the region of Palestine. Anyone with roots in the region that is now Israel, the West Bank and Gaza is technically a Palestinian, but today the term predominantly associates with the descendants of the indigenous population of the region. Whilst the history of a distinct Palestinian national identity is a disputed issue amongst scholars, and politicians, approximately 12 million people today identify as Palestinians, as defined in the Palestinian National Charter of 1968. The first list "Mandate period and after" consists of people who identify as "Palestinians" since the creation of Mandatory Palestine in 1920. The list does not include those Palestinian Jews and other Israeli citizens who are native to the geographic region of Palestine unless they self-identify as "Palestinians". The second list "Pre-Mandate" consists of people with roots in the region of Palestine prior to the modern identity politics resulting from the creation of Mandatory Palestine and the Israeli–Palestinian conflict. Samaritans, Druze, Palestinian Jews, and Dom are native to the geographic region of Palestine, but the list also include some famous names and titles as exonyms, prior to nationalism and national identity becoming commonplace in the modern era. ^ Tessler, M. "A History of the Israeli-Palestinian Conflict" (Indianapolis: Indiana University Press, 1994), p. 62. ^ Dowty, Alan (2008). Israel/Palestine. London, UK: Polity. p. 221. ISBN 978-0-7456-4243-7. since the seventh century, they have been predominantly Muslim in religion and almost completely Arab in language and culture. ^ Butenschon, N.A. Ed. ; Davis, U. Ed. ; Hassassian, M. Ed. "Citizenship and the State in the Middle East: Approaches and Applications" (Syracuse, N.Y.: Syracuse University Press, 2000), p. 210. ^ Likhovski, Assaf (2006). 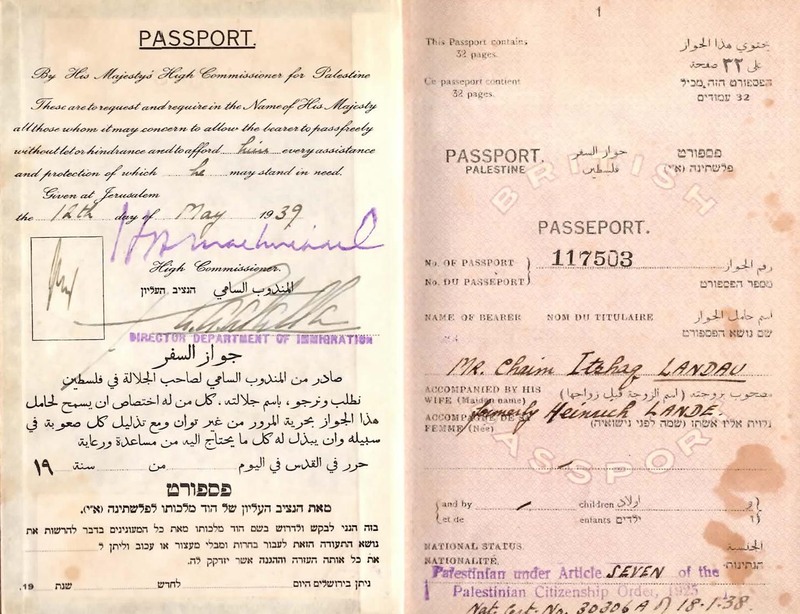 Law and identity in mandate Palestine. The University of North Carolina Press. p. 174. ISBN 978-0-8078-3017-8. ^ Bishara, Azmi (Prof.) (8 January 2009). "Professor Azmi Bishara: There Is No "Palestinian Nation", Never Was !". Channel Two (Israel). www.youtube.com. Retrieved 24 June 2015. ^ Bar-Hayim, David (Rabbi) (25 December 2013). "The Palestinian People: One of History's Great Lies- Interview with Rabbi David Bar-Hayim". www.Machon Shilo.org. www.youtube.com. Retrieved 24 June 2015. ^ Gingrich, Newt (10 December 2011). "Palestinians are an invented people, says Newt Gingrich". Interview (https://www.youtube.com/watch?v=dHWJWJocD6A). Guardian News and Media Limited. Retrieved 24 June 2015. ^ Hammad, Fathi (23 March 2012). "Hamas Minister of the Interior and of National Security: Palestinians are a myth, "they are just saudis and egyptians"". Al-Hekma TV (Egypt). www.youtube.com. Retrieved 24 June 2015. ^ According to Rashid Khalidi, the modern Palestinian identity encompasses the heritage of all ages from biblical times up to the Ottoman period. (Rashid Khalidi, Palestinian identity: the construction of modern national consciousness, Columbia University Press, 2009 p.18.) According to Palestinian author Walid Khalidi: "the Palestinians considered themselves to be descended not only from Arab conquerors of the seventh century but also from indigenous peoples who had lived in the country since time immemorial." ("(With reference to Palestinians in Ottoman times) Although proud of their Arab heritage and ancestry, the Palestinians considered themselves to be descended not only from Arab conquerors of the seventh century but also from indigenous peoples who had lived in the country since time immemorial, including the ancient Hebrews and the Canaanites before them. Acutely aware of the distinctiveness of Palestinian history, the Palestinians saw themselves as the heirs of its rich associations.") and according to Palestinian anthropologist Ali Qleibo: "in their customs and manners, fossils of these ancient civilizations survived until modernity—albeit modernity camouflaged under the veneer of Islam and Arabic culture." ("Throughout history a great diversity of peoples has moved into the region and made Palestine their homeland: Canaanites, Jebusites, Philistines from Crete, Anatolian and Lydian Greeks, Hebrews, Amorites, Edomites, Nabateans, Arameans, Romans, Arabs, and European crusaders, to name a few. Each of them appropriated different regions that overlapped in time and competed for sovereignty and land. Others, such as Ancient Egyptians, Hittites, Persians, Babylonians, and Mongols, were historical 'events' whose successive occupations were as ravaging as the effects of major earthquakes ... Like shooting stars, the various cultures shine for a brief moment before they fade out of official historical and cultural records of Palestine. The people, however, survive. In their customs and manners, fossils of these ancient civilizations survived until modernity—albeit modernity camouflaged under the veneer of Islam and Arabic culture." ^ "those Arab nationals who, until 1947, normally resided in Palestine regardless of whether they were evicted from it or stayed there. Anyone born, after that date, of a Palestinian father—whether in Palestine or outside it—is also a Palestinian (..) the Jews who had normally resided in Palestine until the beginning of the creation of Israel in 1948 are considered Palestinians." "The Palestinian National Charter". Permanent Observer Mission of Palestine to the United Nations. Archived from the original on 9 September 2010. Retrieved 9 September 2010. ^ "Palestinian Christian from Bethlehem wins wildly popular 'Arab Idol' song contest". Washington Post. ^ Palestinian public hails local hero of Arab Idol. Ma'an News Agency. 2 June 2013. ^ Jeffrey L. Rubenstein (27 June 2002). Rabbinic stories. Paulist Press. p. 109. ISBN 978-0-8091-4024-4. Retrieved 2 August 2011.